Why businesses spend 37$ billion per year on meetings and still find them unproductive? 37$ billion coupled with 37% of employee time is spent on meetings. When you put in such a huge amount of resources, you expect returns. But much to our dismay, a survey shows that executives consider 67% of meetings to be failures. Clearly, two plus two doesn’t equal four when it comes to most meetings. These statistics sure are scary but if you have spent considerable time in the white-collar world, this fact doesn’t elicit an OH MY GOD! response. We have all been part of conversations or heard our colleagues say things like, ‘I have to put aside doing (actual) work to attend this meeting’ or ‘why do I need to be a part of this meeting’ or ‘dear lord, this meeting could have just been an email’. In fact, 47% of workers complain that meetings are where productivity goes to die. So, should we once and for all push meetings out of our workplace? The answer is NO. Meetings are actually quite useful when it comes to making big decisions, surveying the results of a change that was executed or even planning for a future change. If you think productive meetings are just to be a dream, we might be able to actually help turn that into a reality with some very simple tips. Is a meeting really necessary? First in our list, let’s do away with pointless meetings. Ask yourself, ‘Are we having this meeting to discuss something or are we doing this to just share some information?’ As a general rule, meetings should never be held for the sole purpose of sharing information. That’s what tasks, chats or your internal company software is for. If, on the other hand, you have to decide or discuss collaboratively on something, a meeting is the way to go. Take for example, project planning, setting goals, adopting a new software, thinking of a new marketing strategy… these are all situations that call for a meeting. There’s that one kind of meeting that really soaks up people’s time - status update meetings. Instead of having a meeting, consider using a work management tool where you can see the status of every task within a project. Then, only if necessary you could have follow-up discussions with only those who are lagging behind. This not only saves your time but it ensures that those employees who are up-to-date on their work don’t have to waste their time in purposeless meetings. · What will the meeting aim to achieve? It’s important to have an agenda even if it’s just one item, like, how do we stop customers from shifting to another brand? What often happens is we think our work is done when we have an agenda in place. But what about the end goal? Without an end goal in mind, the meeting could go on and on without knowing where exactly to stop. “You must have a section on the desired outcome, which is different than the agenda,” says Devante Lewis-Jackson, manager of mid-market sales at the Muse. Devise questions like those given below which will then act as the basis in formulating your end goal. Now, you know that your end goal is to have three strategies in place to prevent 35% of your customers from shifting in 6 months. Remember, if you can’t put in place what you’ll be doing in actionable, results-oriented terms, that’s a sign that this meeting is destined to go down the drain. · Do the attendees know what they’re there for? Share the agenda and end goal with the attendees well in advance, typically 48 hours. Nobody should have to walk into the meeting room without knowing why they’re there and what needs to be accomplished. 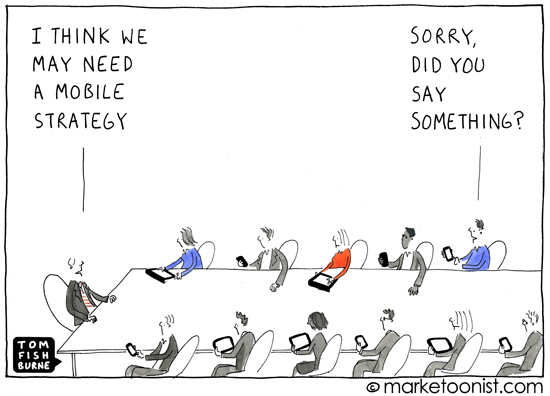 We have been a part of many meetings where 3/4th of the time was spent looking at a presentation while trying not to check our phones. If there’s any material like slides or notes that need to be explained in the meeting, be proactive and send that in advance to the attendees. When people know what they’re there for, the result is more solutions, more answers, more questions than frustrated, blank faces walking into a meeting. · What are some general rules that make up an effective meeting? - The optimal time for a meeting is about 52 minutes, after which our productivity needs a break. The longer the meeting, the more chances for people to lose enthusiasm and get distracted. - At companies with more than 250 people, nearly 40% of meetings start late. If a meeting is set to start at 2:00, close the door at 2:01. From next time onwards, those who have been known to come late will be on time. This can seem a little off-putting at the start. But think about this: If a person is 15 minutes late in an eight-person meeting, that person has cost the organization two hours of lost activity. After all, nothing creates more respect than valuing people’s time. - David Cote, the former chief executive of Honeywell says, ‘Your job as a leader is to be right at the end of the meeting, not at the beginning of the meeting.’ If as a leader you start sharing your thoughts first, you will likely see a table filled with nodding heads, with people mindlessly saying yes to your instincts. As a leader, try to not put up your conclusion at the start. Listen and let others speak. · Do you appoint someone who makes sure the meeting doesn’t go off-track? We have all been parts of a discussion that started from ‘Which is the best available biscuit?’ to ‘That company makes amazing chips’. It’s not uncommon for us to move seamlessly from topic A to topic Z. So, it shouldn’t come as a surprise that this behavior can also ruin your next meeting. For this very reason, meetings generally have a person who acts as a facilitator. The facilitator follows the agenda, makes sure people don’t divert from a topic, acknowledges speakers, limits speaking time so that it doesn’t become a one-man show, encourages new idea, keeps track of time and urges the introverts to speak up. · Do you allow people to multitask at your meetings? Make it a rule that everyone attending the meeting is 100% focused on what’s going on in the room. Unless you are the facilitator or the designated scribe, laptops and mobiles shouldn’t be allowed. We think we can do two things at the same time like replying to an email and focusing on the discussion. But what we don’t realize is one thing normally goes into the background. In fact, having phones within an arm’s reach means constantly wanting to check it. Science shows we literally can’t help ourselves. Besides for every person with a laptop open, there’s a person sitting next to them distracted by their typing or just peeking to see if they’re using Twitter or Facebook. If something is urgent and can’t be put off, allow them to do that work and catch up on the meeting later. They’ll produce better work and your meeting will have engaged participants. · How do you end the meeting? The outcome of a meeting should never be to ‘have another meeting’. End the meeting with actionable items and a clear division of responsibilities. Put this up on a work management tool along with deadlines to evaluate progress and have smooth follow-up sessions. Also, ensure that the meeting summary is shared with all the stakeholders (even if they weren’t present) so their work is aligned with the goals. Meeting summaries along with a list of actions that denotes who needs to do what is a very crucial part which often gets overlooked. Make sure you always have a scribe at your meeting who will take notes. Also, don’t forget to send that anonymous feedback form to evaluate how effective the meeting was for attendees. Ask for their suggestions and if it was a valuable use of their time. · Are meeting audits a thing at your workplace? With all these simple tips, let’s put an end to this thought process and bid goodbye to unproductive meetings. Get the latest posts in email.